Turnkey concept which offers complete activities to promote the development of children as well as professional printable documents to accompany them. Now that spring has arrived, we suggest you try spring cleaning with the group. Grab a broom, a vacuum cleaner, and dusting cloths! Put everything in the correct place. When you go outside, give each child a plastic bag to collect garbage winter has left behind. Have children bring to the daycare a toy, a book, or a stuffed animal which represents a farm animal. Gather all the objects in the centre of your circle. Randomly select an object and have children tell you everything they know about the animal in question. Tell children the story of the three little pigs. Have children tell you all the facts they know about different farm animals. See if they can name the male, female, and baby animals. What is the purpose of a cow's udder? What are chickens' eggs used for? What do different farm animals provide us with? What do farm animals eat? What do you know about sheep's wool? Discuss the farmer's role. Disguise yourself as a farmer. Have children guess which profession you represent. Ask the group which animals a farmer takes care of. What are his chores? Using different sizes of boxes, mattresses, blankets, or blocks, invent three different houses like in the story of the three little pigs. Each child can build his own house or they can be built as part of a collective project. Children can pretend to be the three little pigs and visit the different houses. The pictures may be used as a memory game or to spark a conversation with the group. Use them to decorate the daycare or a specific corner. 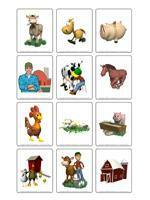 (Open picture game - Farm animals) Print, laminate, and store in a "Ziploc" bag or in your thematic bins. Activity sheets are suggested for each theme. Print and follow instructions. 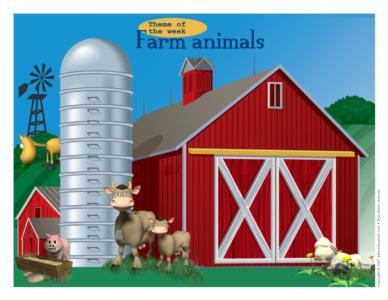 (Open activity sheets - Farm animals). This is the perfect time to use the farm we all have in our daycares! Make wooden blocks available. Add wooden planks you may have left over from recent renovations. Sand them to soften the edges. Add Easter straw to resemble hay.Children can build on top of it, use it to feed the animals, or fill their constructions with it. Farm animal impressions on cardboard can be used as puppets. Provide recycled materials. Children can use them to create a farm scene. They may require your help but they will be so proud of the result! Plastic farm animals can be dipped in paint to make paw prints on paper. A large sheet of paper or a white sheet can be used for a collective farm craft. Decorate the area with farm illustrations, animal pictures, etc. Transform the area to create a puppet theatre! You'll be surprised to see the stories children can invent with cow, sheep, and duck puppets! 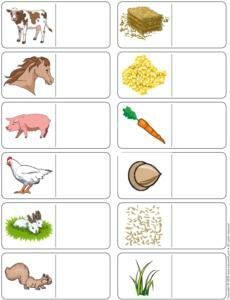 Memory game using farm animal illustrations. There are many store-bought versions. You can use educatall pictures to make your own! Black and white modeling dough to create cows, brown dough for sheep, etc. This may be a good time to make your own homemade modeling dough. Let children mix colours to invent their original farm animals! Farm animal cookie cutters are easy to find and are fun to use! Association games involving animal sounds. Your local library can be a great source! Books about farm animals. Children can share some of their favourite farm animal books with the group. Stuffed animals representing farm animals to cuddle up with! A short story which encourages children to imitate animal sounds when a farm animal is named. A container filled with oats! Many animals eat oats! The flashcards may be used during circle time to spark a conversation or in your reading and writing area. They may also be used to identify your thematic bins. 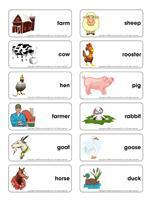 (Open word flashcards - Farm animals) farm, cow, hen, farmer, goat, horse, sheep, rooster, pig, rabbit, goose, duck. Fill a container with wood shavings. Add figurines (hen, horse, sheep, pig, chicks, rabbit, farmer, etc.). Children will enjoy playing in the farm. (Open game - Pig) Print, laminate, and cut out. Display the big pink pig on the wall. Give each child a laminated tail. Blindfold children. One at a time, children attempt to place the pig's tail in the correct place. (Open shapes - Farm animals) Print, trace onto cardboard, and cut out. Use a hole-punch to make holes around the contour of the shapes. Children enjoy lacing the shapes with a piece of yarn. (Open mice) Print and laminate. Deposit tiny mice throughout the daycare. Place them so only the tails are visible. When you give the signal, children search for mice. There is no winner for this game. The only goal is to have fun! At the end of the game, give each child one mouse to bring home. Variation: You many want to colour the mice using different colours. Ask children to collect mice one colour at a time. Fill a large container with wood shavings. Add figurines (rooster, hen, chick, eggs, etc.). Children will have fun! Deposit hoola hoops on the floor. Children jump in the hoops. They can also try jumping between the hoops. Stand at one end of the room. Have children stand at the opposite end of the room with their backs to the wall. Show them the bunny illustration. They move towards you, hopping like bunnies. Show them the chick illustration. Children crouch down and peck like chicks. Alternate the bunny and chick illustrations until the group has reached you. Start over. Give children strips of crepe paper in several colours. Have them dance, jump, and twirl to the sound of music. You can attach the strips of paper to children's clothing or insert them in their waistband, sleeves, or collar. One player is a dog. The other children are sheep and they crawl around the daycare. The dog tries to catch them. If the sheep lie on their back, they are safe and the dog cannot catch them. If a sheep is touched by the dog when he is crawling, he becomes a dog too. He can try to capture sheep. The game ends when there is only one sheep left. Place animal figurines in a bag. Children insert their hand in the bag and try to guess which animal they are touching. This imaginary game is very simple and requires little or no material. It can be done sitting on the floor or on chairs. You are riding your tractor to the farm. Pretend to travel on a bumpy road when suddenly, to your left, are the sheep. Look at all the little lambs! A little farther down the road, there are cows. Try to count them... As you continue down the road, you must stop abruptly because ducks are crossing! This game can last a very long time! Children will quickly understand and make their own suggestions along the way! Hop on a broomstick and ride your horse! Divide the group into three families. There should be a horse family, a sheep family, and a pig family. Whisper the name of one of the animals into each child's ear. When you give them the signal, they must imitate the animal they were given. What a racket! A child selects a small farm animal figurine and hides it in his hands. The object of the game is to describe or imitate the animal so the rest of the group can identify it. The first child to guess correctly is the next player. Children sit in a circle. The first player says "When I go to the farm, I see (...)" The player chooses an animal. The next player says the same sentence, repeating the first player's animal and adding another one. The game continues until everyone has had a turn. Variation: For older children, have them make the animal sounds, repeating all the previous ones before adding a new one. This game requires several farm animal figurines. Use small overturned strawberry baskets to represent pens. Number the pens, 1 thru 5 for example. Have children place the correct number of figurines in each pen. Choose a child to be the leader of the game. The leader moves about the daycare making various gestures. The other children copy all of the rooster's moves. After a while, give another child a chance to be the rooster. Variation: You may choose to ask a child to imitate another farm animal and have the other children imitate his actions. Hang two large pieces of green and blue construction paper on the wall. Use magazines or other animal illustrations. Children place the pictures on the correct paper, blue if the animal lives in water and green if the animal lives at the farm. (Open Game - Where do animals live?) Print and laminate the game. Using Velcro, children must find the correct habitat for each animal. Children group into teams. Using farm animal puppets, each team invents a short story. Fill a latex glove with milk. Use a rubber band to tie it. Hang it so children have easy access to it. Place a container below it. With a needle, make tiny holes at the tips of the fingers. Show children how to milk a cow. Provide each child with a small, airtight container. Pour 35% cream into each container. Have children shake their container. Point out the change in texture (butter). Cut a cantaloupe or honey dew melon in two. Empty the melon by making tiny balls. Place the melon in a plate so the outside of the melon is on top. Slide the melon balls, cheese, and other types of fruit onto skewers. Insert one end of each skewer in the melon. Children will love eating the cheese like little mice! Remove the peel from the carrots and oranges. Cut them into pieces. Mix the two together. Add the maple syrup and lemon juice. Pour into glasses and serve. This recipe is easy to prepare with children. Provide them with plastic knives. Have them cut the spinach into small pieces. Combine the mayonnaise, sour cream and soup mix in a large bowl. Ask children to add the spinach. Let children dip their favourite veggies, whole wheat crackers, or whole wheat pitas. This dip is delicious and healthy. It is packed with vitamins to provide the farmer with enough energy for his busy day! 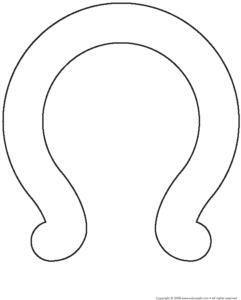 (Open craft - horseshoe) Print and cut out of heavy cardboard (cereal box for example). Cover it with aluminum paper. Make a collage using pieces of yarn or spaghetti. Use pink modeling dough to sculpt little pigs. Provide children with a variety of craft material such as wooden popsicle sticks, raffia, small blocks of Styrofoam, etc. They can recreate the three little pigs' houses. (Open craft - Three little pigs) Make puppets with the group (pig, wolf, and house). Cut out and glue onto popsicle sticks. Make a simple pig snout by cutting an empty toilet paper roll in two. Paint it pink and punch a hole on either side. Add string to tie it over children's noses. Place a Styrofoam glass upside down. Glue cotton balls over its entire surface. Cut a circle out of white construction paper or cardboard for the head. Add cotton balls and wiggly eyes to it. (Open shapes - Farm animals) Print a sheep for each child. Have them cut their sheep onto a piece of cardboard, cut it out, and cover it with glue. Add dry oats or popcorn to the sheep. Paint the bottom of children's feet yellow. Have them make a print on a sheet of white paper or construction paper. When the print is dry, it will represent the chick's body. Glue feathers onto the end of each toe. Cut the eyes and beak out of scraps of paper. You can add bird seed on the paper to "feed" the chick. Use any farm animal figurines you have on hand. Dip them in poster paint and have children make impressions on paper. Create a barn with a small empty milk carton. You can paint it red and black. Use scraps of construction paper to make windows and a barn door. Use an empty "Pringles" container to make a silo. Any cylinder-shaped container will do. Cover it with construction paper or aluminum paper. To complete your barn, use cookie cutters shaped like farm animals to create animals in modeling dough. Bake, paint, and display them as you wish. Use upside down strawberry baskets to create cages for the animals. They can be painted and you can add hay. Have children place animal families under each cage. Trace the outline of children's hands on paper. Make sure they place their thumb upwards since it will represent the rooster's head. Add an eye and pretty colours. Repeat with pig, cow, etc.